Over a year ago, I described the conundrum Republicans faced as view it now http://chrisdodsonmusic.com/?p=1738 the deficit they were fuming against was largely a result of policies that benefited their own constituencies. Those over 55 who were the only demographic group to vote Republican (even in the Democratic wave years of 2006 and 2008) benefited the most from the trillion dollars spend on Medicare and Social Security. Our military spending nearly matched the rest of the world’s combined — and if you include other national security spending — totaling another trillion. And then there were the various tax incentives and loopholes for big corporations adding up to another few hundred billion dollars. Further, Republicans were committed to not raising taxes on anyone — especially the richest. I really would like to see Romney explaining to Republican voters that his plan is different than Obama’s because his didn’t cut Medicare. It might even work. It would just be hilarious. [digg-reddit-me]Last week I wrote a semi-irresponsible post about how Republicans are waging a generational war* by opposing fiscally responsible health care legislation. It was a variation on the common refrain from the right that all sorts of government programs are in fact “generational theft.” This memorable phrase was coined by John McCain to describe the stimulus bill, but there is nothing in principle to distinguish it from all deficit spending. Bill Frezza writing in Real Clear Markets in a more recent example of this right wing meme called Social Security “a Ponzi scheme” which in which the younger generations are being screwed. The general message of the “generational theft” meme is that the young shouldn’t expect to benefit from government spending – but should only see it as a burden. People of all political stripes acknowledge the approaching fiscal apocalypse, but each party’s responses and proposed solutions have been shaped by their core constituencies and their ideology. The next two posts will explore each party’s approach in more depth, but in short: Republicans, believe government is the problem; yet as the currently elderly, along with big corporations and the military are core interest groups and the primary beneficiaries of the status quo, they implicitly propose a deal whereby they maintain the status quo today – and then eliminate or drastically reduce entitlement spending on future elderly, the young Democrat-voting generation now, as well as, presumably, shrinking the government by eliminating other spending programs that do not benefit their interest groups. Get the GDP growing again. A growing economy expands the tax base and reduces welfare spending, and – most important – reduces the size of the deficit in relation to the economy making it easier to pay off. 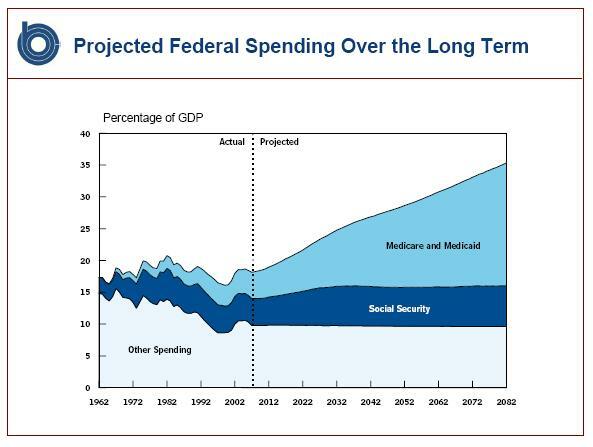 Curb the growth in health care costs – thus alleviating the biggest factor leading to the explosion of the deficit. With these two factors relieving pressure, strike a Grand Bargain. Either through a technocratic commission or through bipartisan legislation, push through some combination of taxes and adjustments to current programs to make them sustainable. Both of these plans are risky. But any path we choose now will be risky – due to the incredible and seemingly deliberate starve-the-beast-style (see next post) fiscal irresponsibility of George W. Bush’s administration, coupled with a downturn and the looming fiscal crisis. Part 2 on the Republican approach found here. Parts 3 and 4 discussing the Democratic approach and then lessons from this moment of “welfare scleroris/imperial overstretch” coming tomorrow and Friday. *I know that’s a bit unfair, a bit too pithy to be true. But the simple messaging – the oversimplification – can be a useful tool to get people to think if it is not used to reinforce the conventional wisdom. All too quickly, using such an oversimplified scheme, one can come to the wrong conclusions – which is part of the reason George Orwell in his “Politics and the English Language” stressed using original phrases. The first time one encounters such a phrase – it can prompt thought. But all too quickly, it solidifies into dogma and ideology. 1. The Un-American Pledge. Michael Lind explains why the Pledge of Allegiance is un-American. If you don’t think an independent Medicare commission empowered to make decisions that automatically become law unless Congress comes up with equivalent savings will do the trick, then you have a responsibility to suggest something that will. Otherwise you’re just placing a bet that America’s government is going to self-destruct—a tenable argument, certainly, but not very helpful. 4. Anti-Statism: As American as Apple Pie. John P. Judis of The New Republic delves into the undercurrent of anti-statism in the American psyche. 5. Getting depressed about the public option. Timothy Noah depressed me more than anyone else with his ruminations on the public option. 6. Feeling better about health care reform. These pieces by Ron Brownstein and Andrew Sullivan though have made me feel much better about health care reform in general. Brownstein’s piece is especially helpful in looking at the various cost-cutting measures in the bill, and has a rather optimistic take. President Obama has apparently made that post “required reading” among White House staff. I’ll be following these posts up at a later date. 7. Abortion politics. The New Yorker had an extraordinary interview about abortion politics with Jon Shields. Shields seems to be, himself, pro-choice, but he seems to have reached an understanding of abortion as an issue which contradicts the propagandistic rhetoric that passes for most liberal commentary on abortion, which presents its opponents as being mainly concerned with keeping women in their place. They called Medicare and Social Security “tyranny” too. As Maddow said – it is a very important point. Many of the Republicans participating in this national “conversation” are hiding their true beliefs. Most Americans do not consider Medicare and Social Security to be “tyranny.” Those who are inciting fears about health care reform do. While researching a few facts about health care, I came across this excellent Paul Krugman article on health care in the New York Review of Books from 2006. Anyone who wants a good overview of the debate should check out the article in full – but here are a few highlights. per capita spending for an adult Medicaid beneficiary in poor health would rise from $9,615 to $14,785 if the person were insured privately and received services consistent with private utilization levels and private provider payment rates. changes in Medicare spending in the last three decades has largely tracked the growth rate in private health insurance premiums. Typically, Medicare increases have been lower than those of private health insurance. Unlike Medicare’s clients—the feared senior group—Medicaid recipients aren’t a potent political constituency: they are, on average, poor and poorly educated, with low voter participation. As a result, funding for Medicaid depends on politicians’ sense of decency, always a fragile foundation for policy. A classic study by the Rand Corporation found that when people pay medical expenses themselves rather than relying on insurance, they do cut back on their consumption of health care—but that they cut back on valuable as well as questionable medical procedures, showing no ability to set sensible priorities. There are some who question the scale of our ambitions — who suggest that our system cannot tolerate too many big plans. Their memories are short. For they have forgotten what this country has already done; what free men and women can achieve when imagination is joined to common purpose, and necessity to courage. It seems that Obama is preparing to bet his presidency on a Grand Bargain – that will allow him (and us) to rewrite the social contract in a more extensive way than any president since Franklin Delano Roosevelt. Even during Obama’s campaign, he spoke of tackling the challenges that were necessary – and not putting off hard discussions about our country’s long-term stability. But the financial crisis – which at first prompted the endlessly parroted conventional wisdom that whoever won would need to cut all of their projects and focus narrowly on the crisis itself – has instead proved to be an opportunity. The amount of spending needed to stimulate the economy is enormous – with the numbers being thrown around today dwarfing that of any previous government intervention (save perhaps for our major wars). What Obama understands is that this type of spending, while necessary in the short-term, poses a serious long-term threat. Which is why he is now speaking of the second step – after the financial crisis has passed – of tackling entitlement reform and tax reform, and finally putting America on sound financial footing after years of prolifigacy. None of these insights are exceptional. What is exceptional is how Obama is already shaping the arch of his first term, using this crisis to set up his next objective, and shaping the conventional wisdom. Release the rest of the funds from TARP. A large stimulus package to demonstrate the government’s commitment to addressing the crisis, especially in alleviating it’s effects on the majority of Americans. A banking and mortgage bill that takes whatever steps are necessary to shore up these sectors of the economy, including new regulations, new oversight, and possibly additional funds. An infrastructure bill that would create a National Infrastructure Bank. Health care reforms that would extend health care benefits and attempt to control the escalating health care costs. A combination of a cap-and-trade program and funding for green energy. The goal of this first period would be to begin to make both short-term and long-term investments into those sectors that will lead to long-term growth – which will stimulate the economy in the short-term. This is the spending stage. After this burst of legislating, Obama would be able to focus on tinkering with education programs and seeing what works, as well as addressing the simmering foreign policy issues which are constantly threatening to take over the agenda. Entitlement reform (Social Security, Medicare, Medicaid.) Everything is on the table. Tax reform. Not much has been said about this. This will certainly be a wild card – but Obama has criticized our corporate tax rate for its irrationality. It’s very high – but due to the enormous number of exemptions and credits, the effective rate for those businesses able to lobby for benefits, it is very low. This should be rationalized. This is the “cutting back” stage and consolidation stage. The goal of this second stage would be to put America on a solid financial footing again – to eliminate the unsustainable domestic policies that undermine our stability and power. This is obviously an enormous agenda. And it’s far from clear that Obama can accomplish this. But if he does not lay out the vision – which I have pieced together from numerous statements – then it’s hard to see how he can accomplish it. Of course, Geithner was just confirmed last week – and Obama’s only been in office for two weeks – so he does have a bit more time to lay this out. But he doesn’t have long.